- Photos: white sharks, gator "chin-up"
A search this winter for imperiled snakes led to the discovery of a remarkable arthropod that hadn’t been documented before in Georgia. In December, Matt Moore and Ben Stegenga of The Orianne Society were doing a DNR-supported survey for federally threatened eastern indigo snakes at Little Ocmulgee State Park near McRae when they saw a fresh snake track at a large gopher tortoise burrow. Using a burrow camera, they scoped the tunnel to find an eastern diamond-backed rattlesnake curled about 6 feet from the entrance. The men watched the rattler, chuckling as it tongue-flicked the cylinder that houses the camera, before getting ready to go. 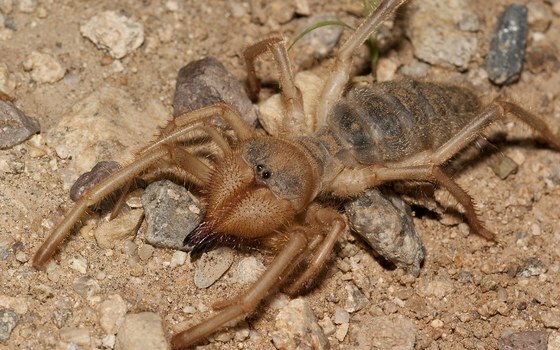 Then they noticed an odd-looking invertebrate scurrying between their legs in the burrow’s sugar-sand apron. Read Dirk’s post on the Wildlife Resources Division blog about these unusual and fearsome-looking invertebrates. Well-known Georgia naturalist Dirk Stevenson is a herpetologist and Longleaf Savannas Initiative director with The Orianne Society. He blogs at The Naturalist and can be reached at dstevenson@oriannesociety.org. 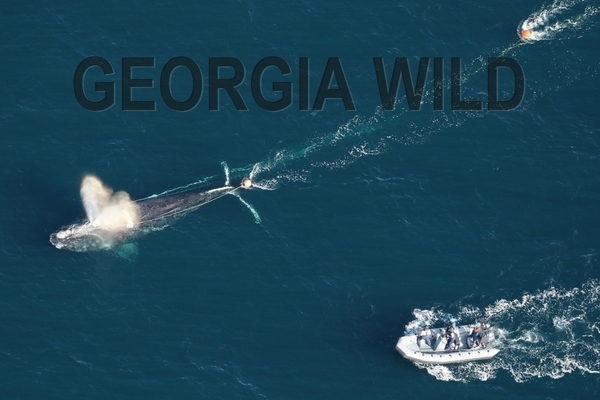 The North Atlantic right whale freed from commercial fishing gear off Cumberland Island last month was seen last weekend in Massachusetts’ Cape Cod Bay, a hopeful sign for the whale and the endangered species. The Center for Coastal Studies spotted Eg3530, nicknamed Ruffian, during an aerial survey Feb. 19. Concentrations of microscopic zooplankton on which right whales feed make Cape Cod Bay a whale hot spot in late-winter and spring. “We were very excited he made it back to the feeding grounds," said Clay George, DNR's lead marine mammal biologist. "Severe entanglements sap a whale's energy reserves." 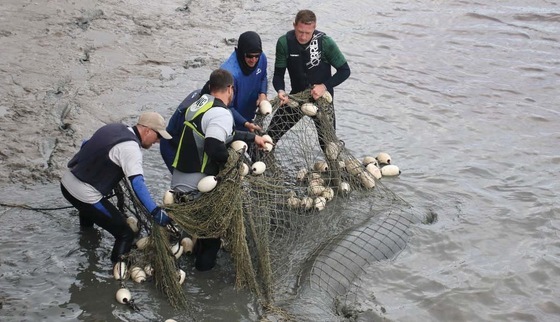 Ruffian was dragging about 450 feet of rope and a 135-pound trap/pot nearly 6 feet in diameter when the DNR Nongame Conservation Section, the Florida Fish and Wildlife Conservation, NOAA Fisheries and Sea to Shore Alliance disentangled the 42-foot-long male on Jan. 5 and 6. Scientists estimate there are as few as 440 North Atlantic right whales left. Entanglement in commercial fishing gear, with line catching on flukes, flippers or baleen in the whale’s mouth, is a leading threat. 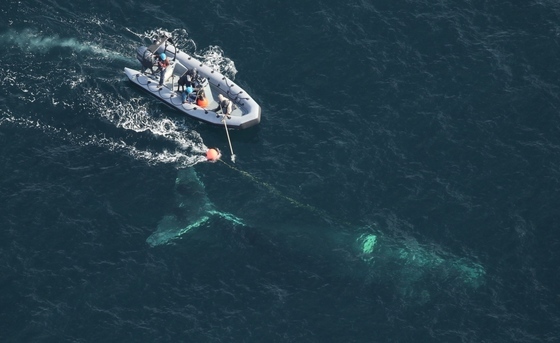 More than 80 percent of right whales bear scars from entanglement, according to the New England Aquarium. Videos compiled by George – Rescuing Ruffian part 1 and part 2 – document the disentanglement on Facebook. - With a month to go in the right whale calving season, three calves have been seen in the Southeast this winter. That’s the second-fewest since the 1980s, when it was discovered that the whales calved in coastal waters off South Carolina, Georgia and Florida. Coverage: Woods Hole, MA; The (Brunswick) News. - There could be a silver lining. Following 2000, when a record low of only one calf was seen, 31 calves were reported in 2001. - Ruffian’s rescue included the U.S. Navy cancelling a missile training exercise that would have grounded aerial support needed for the disentanglement. Since 1989, the state income tax checkoff for the Georgia Wildlife Conservation Fund has provided critical support for conserving nongame wildlife, rare native plants and natural habitats in our state. Yet contributions hit a new low of $131,248 last year, 45 percent less than in 2015. What can you do? Give to the Wildlife Conservation Fund checkoff when filing your taxes this year. Any amount helps and giving is easy: Just fill in an amount more than $1 on line 26 of the state’s long income tax form (Form 500) or line 10 of the short form (500-EZ). Your donation will go to a fund dedicated by state law to benefit wildlife and the wild places they need and Georgians treasure. - Buy or renew a DNR eagle or hummingbird license plate. Both support the Wildlife Conservation Fund. - Learn more about research and other work the checkoff supports in the Nongame Conservation Section’s annual report. OUT MY BACKDOOR: EARLY-NESTING NEXT? I must admit I have never experienced a winter quite like this one. It has been so unseasonably warm that the best way to describe it is we are going through springtime in winter. The weather has prompted many plants to bloom far sooner than normal. In my yard, spring favorites such as forsythia, kerra, Japanese magnolia, baby's breath, apple, pear, daffodil, coral honeysuckle and even an azalea are all blooming. Because of their reckless urgency, the blossoms stand a real chance of being nipped by frost and, consequently, the plants likely will not bear seeds this year. You may also be asking yourself whether birds in your yard will also be fooled and begin nesting well outside their normal nesting season. 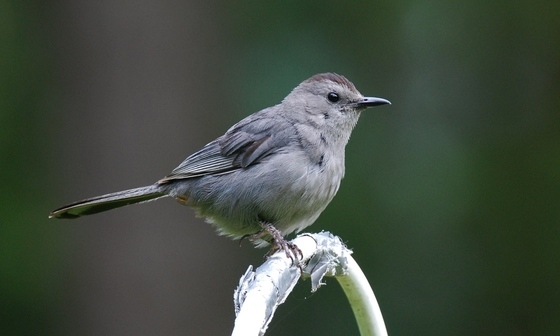 Read Terry’s column on what does or doesn't trigger bird-nesting behavior. Two manatees were rescued from the Savannah River at Port Wentworth last month after falling temperatures and a temporary mill closure threatened to leave the endangered mammals out in the cold. Manatees usually migrate south to Florida in fall, but warm water from the mill and unseasonably warm temperatures apparently disrupted that migratory behavior. A cold front in January left the adult females trapped at the mill outfall. Crews including DNR, SeaWorld Orlando, Florida Fish and Wildlife Conservation Commission, U.S. Fish and Wildlife Service and Georgia Sea Turtle Center caught and moved them. Both are being monitored at SeaWorld, which plans to release them with tracking transmitters. The Claxton Rattlesnake and Wildlife Festival is turning 50. Set for March 11-12, the Evans County Wildlife Club event transformed in 2012 from rattler roundup to wildlife ed event will feature everything from snakes to country music. The Fitzgerald Wild Chicken Festival will draw a crowd to that south Georgia city March 17-18 with music, a street dance, crowing contest and more. This former rattlesnake roundup touts Fitzgerald’s wild Burmese chickens. Peregrine falcons are back at Tallulah Gorge State Park and hopes are high for a third straight year of nesting -- the state's only known peregrine nest not in metro Atlanta. The north Georgia park has temporarily closed the wall to rock climbing and staff said the female falcon spent time at the 2015 nest site Thursday. Who will nest at The Landings bird cam site? The great-horned owls live-streamed as they raised young in the Skidaway Island pine haven’t returned this winter, but ospreys are showing interest in the nest, as they did after the owls left last year. Meanwhile, both eggs in the Berry College eagle nest have hatched. The recent removal of 17 plant and animal species from a petition for Endangered Species Act listing has roots in fall’s Southeast Partners in Plant Conservation conference. 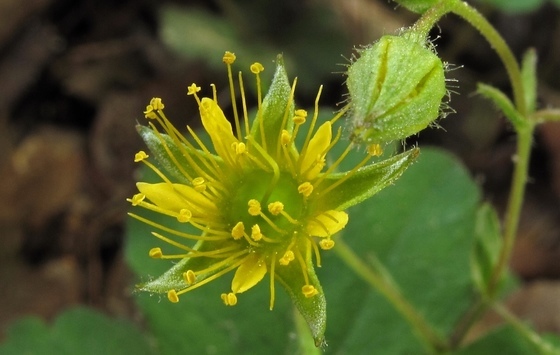 At the Atlanta meeting that DNR and other Georgia Plant Conservation Alliance members helped hold, a review of the status of 280 rare and petitioned plant species determined that 10 (seven in Georgia, such as Piedmont barren strawberry) did not need federal protection. The 10 were later dropped from the petition, freeing U.S. Fish and Wildlife Service resources for higher-priority species. Young birders and artists will want to check out DNR’s 2017 Youth Birding Competition and T-shirt Art Contest. The deadline to enter the art contest is March 8, with March 31 being the last day to register for the statewide birding competition set for April 29-30. Details and registration. 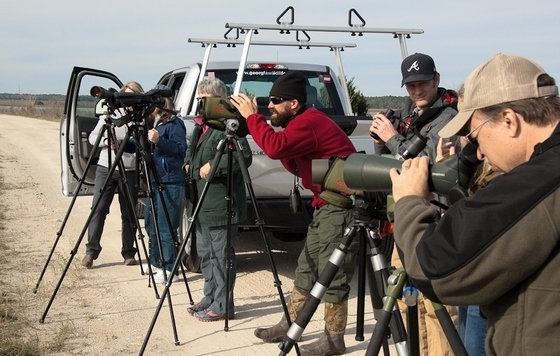 The Youth Birding Competition was an inaugural One Hundred Miles 100 honoree. In January, the Georgia coast environmental group lauded 100 individuals and organizations that “have made a significant and lasting difference” on the coast, a list that included Georgia’s State Wildlife Action Plan. Camp TALON includes two sessions this year, June 3-8 and June 17-22. Registration has opened for the coast-based DNR camp designed for teens with a strong interest in the outdoors, birding and ecology. Teachers and students are invited to celebrate Georgia’s wildlife and students’ artistic interests by participating in the 27th annual Give Wildlife a Chance Poster Contest. This competition sponsored by DNR and the State Botanical Garden of Georgia is open to grades K-5. And don't forget the 18th annual Wildlife Forever State-Fish Art contest. With entries due by March 31, K-12 students can land prizes and recognition while learning about native fishes, behaviors, aquatic habitats and conservation. Forestry for Wildlife Partners with Gov. Deal. 2016 Forestry for Wildlife partners were recognized by Gov. 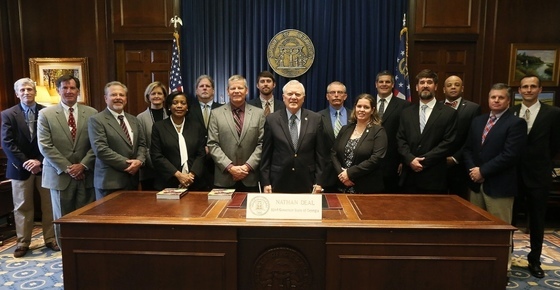 Nathan Deal, DNR Commissioner Mark Williams, Deputy Commissioner Walter Rabon and others at the State Capitol Feb. 8. 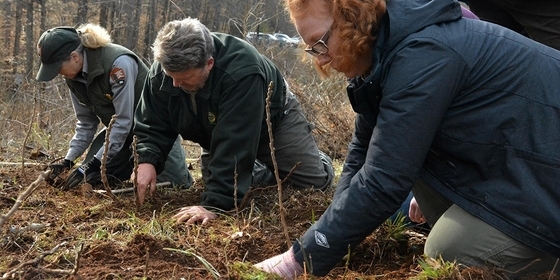 Stewardship and land management by Georgia Power, Weyerhaeuser and CatchMark Timber Trust had a positive impact on 1 million acres in Georgia through the DNR’s Forestry for Wildlife Partnership. In another photo highlight, DNR staff joined with Gov. Deal and other wildlife and forestry agencies to celebrate Feb. 5-11 as prescribed fire awareness week – and to mark the introduction of mascot Burner Bob (photo). Prescribed fire is safe way to apply a natural process, ensure ecosystem health and reduce wildfire risk. A gopher frog egg mass collected this month at Fall Line Sandhills Wildlife Management Area near Butler will benefit a captive-rearing effort to re-establish one of Georgia’s most rare frog species at an experimental site in Early County. Project partners include UGA’s Warnell School of Forestry and Natural Resources, The Amphibian Foundation, Blue Heron Nature Preserve, Fish and Wildlife Services’ Warm Springs National Hatchery, The Nature Conservancy and Joseph W. Jones Ecological Research Center. Gopher frogs were recorded calling last month at Alapaha River Wildlife Management Area. The calls coming from a wetland indicate that the new WMA near Tifton has at least one breeding pond for gopher frogs. Birding trip at Weekend for Wildlife. The 29th annual Weekend for Wildlife held Jan. 27-28 at Sea Island raised more than $1.1 million, the majority of which, after expenses, will go to conserving nongame wildlife, rare plants and natural habitats, according to the Georgia Natural Resources Foundation. 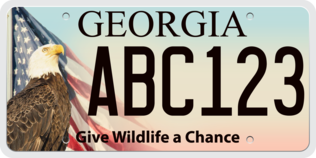 Weekend for Wildlife is one of the big three fundraisers for the Georgia Nongame Wildlife Conservation Fund, along with the fund’s state income tax checkoff and DNR eagle and hummingbird license plates. Names in the news: Matt Elliott has been promoted from program manager to assistant chief of DNR’s Nongame Conservation Section. Among other work, Elliott was key in developing and implementing the State Wildlife Action Plan, leading the Gopher Tortoise Initiative, and coordinating staff involvement in the Southeast At-Risk Species program. Dr. Jenny Cruse-Sanders, former Atlanta Botanical Society vice president for science and conservation, is the new director at UGA’s State Botanical Garden of Georgia. Wilf Nicholls is stepping down after more than six years as director. Longtime northeast Georgia state parks manager Danny Tatum, who recently retired after 32 years with DNR, was recognized at the State Legislature with a House resolution. Ossabaw Island Foundation trustees named Dr. Paul Pressly director emeritus of the Ossabaw Island Education Alliance, which he has led as director since 2005. U.S. Fish and Wildlife Service Director Dan Ashe retired Jan. 20 after 22 years with the agency. "Georgia’s youth birdwatching, T-shirt contests accepting entries," SaportaReport. Also: Coastal Courier. "Hubbard Elementary teacher wins Georgia DNR grant," The (Macon) Telegraph. Also: Monroe County Reporter. 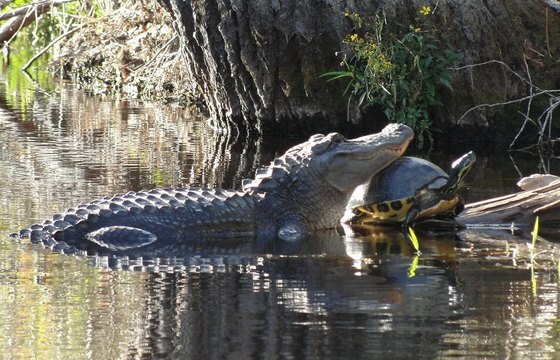 In this reptile version of The Odd Couple, an alligator rests its head on a Florida red-bellied turtle at Okefenokee National Wildlife Refuge. Dr. Judith C. Scarl of the North American Bird Conservation Initiative photographed the basking duo. A manatee carcass attracted these two great white sharks earlier this month. 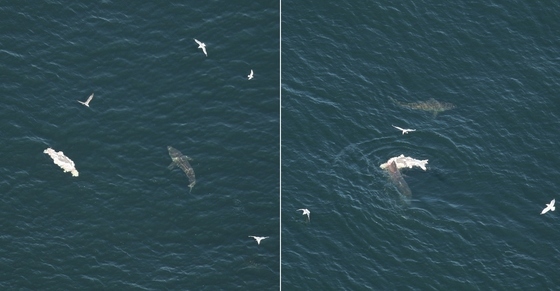 Florida Fish and Wildlife Conservation Commission staff flying a North Atlantic right whale survey about 16 miles off Little Cumberland Island Feb. 14 photographed the sharks, one of which was seen feeding on the carcass. 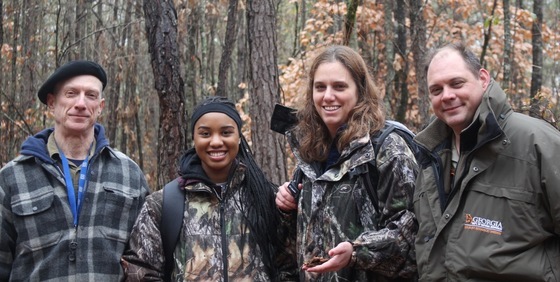 Jasper County High biotech student Jessica Moore is applying information learned in “What is a lichen” training at Charlie Elliott Wildlife Center to her research project comparing evolutionary relationships of local fungi.